Where were you on the morning of September 11, 2001? Artie Van Why was in New York City, working in his office building across the street from the World Trade Center. In That Day In September (a personal remembrance of 9/11), Van Why offers his story of the shock and devastation of that morning, life in the city in the weeks that followed, and the impact of the experience on his future. 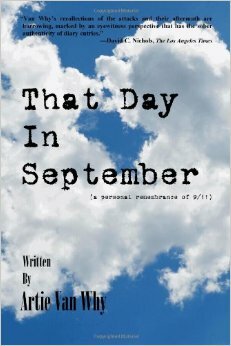 This is an incredibly moving, vivid and personal description of one man's experience on the ground on 9/11. From the initial sound of the first plane hitting the tower, to the feelings of despair and uncertainty, Van Why brings the reader into his heart and mind that day and the days that followed. This brief, 84-page memoir reads like a diary, offering a glimpse of what it was like for the author to be in New York as the towers were struck and fell. Van Why shows the compassion people in the city had for one another during and after the attacks, and the way the horror of what happened brought people together. And he shows how this one event changed his life forever. As we come upon the tenth anniversary of the 9/11 attacks, I recommend you sit down and read That Day In September. It brought me back to that day and allowed me to reflect on what happened in a way that news stories and old TV footage wouldn't have. This review was written based on a copy of That Day in September that I received from the author in exchange for an honest review. I was contacted about this book. as well, but with my personal experience I declined as I was not up for reading about it. I'm glad you did, though.